Tax Free shopping – it is VAT refund service that is provided to foreign (residing outside EU) shoppers for purchased in European Union goods that are exported out of EU. Purchasing goods and claiming your refund is very convenient. Tourist makes a purchase and obtains prepared Tax Free forms. When Leaving EU territory, Customs stamp Tax Free forms to approve goods being exported out of EU and then tourist can earn VAT refund. Shopper needs to provide customs-approved Tax Free forms to Tax Card representatives and refund will be paid by shopper’s selected method. 1. Tax Free form provision. After purchase You must receive a filled Tax Free form. Please keep your purchase receipt together with prepared Tax Free form. 2. Customs approval for exported goods. Travelling out of European Union territory, a representative of customs will put stamp to approve that goods are exported out of EU. 3. Refund payment. 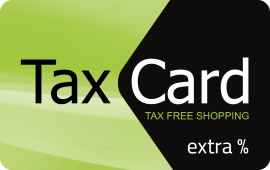 Customs-approved Tax Free form is provided to Tax Card representatives in the same customs zone and cash refund will be given to you immediately. You can also send customs-approved Tax Free form by post using an envelope with return address. Sending expenditures are covered in advance. After we receive Your Tax Free forms, refund payment will be transferred to your credit card account or personal account trough one of selected payment systems – PayPal, Payza, Western Union, WebMoney, Easypay, MoneyGram and Alipay. 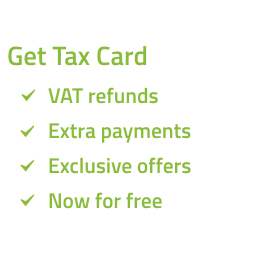 The minimum purchase amount, for which VAT refunds is obtained, is 55 EUR. No refund is issued for alcoholic beverages, tobacco, fuel, gold jewelry and for services such as haircut, food services, etc.